Let The Darkness memes begin! Edit: Oh... Not quite sure how they interact actually... Anyone know? Faceless shambler approves of this card. This message is brought to you by the Society of Eerie Statues. The possibility of Flamewreathed Faceless makes me nerveous when played against me. 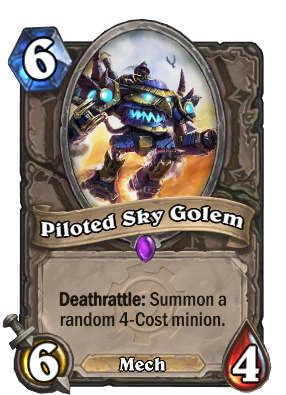 I wonder how a Captain's Parrot can control a Piloted Shredder to ride a Piloted Sky Golem? Cairne is more consistent, as well as harder to remove, but Sky Golem is more fun. Yeah seriously, just the fact that you can get a Shredder alone makes this legit. Like Cairne, These deathrattle minions are very good against Warrior and Paladin. If you play combo Druid, this card should take the place of Cairne now, for it has higher attack and poses a greater threat. But I'm not sure whether that applies to control decks as well. As has been said, control decks value toughness and stability. While I don't think it's better than Cairne, as toughness is typically valued higher in constructed, it's certainly a good card to include if you want more of this type of effect. I'd say it's very hard to tell which one is better, as the 6-attack on the first body may be exactly what the metagame calls for as well. At the time of this post, there are 41 4-drops. Looking through them, I would say ~1/3 I would be happy to get (worth 4 mana), but over 1/2 I would be particularly unhappy to get (3/4 or worse stats). That does leave close to 1/6 that I would be okay with but not super excited with. (3/5 and 4/4 with potentially useful effects.) Unless you really want the 6 attack, Cairne is much better. Cairne is better in all ways, except for no mech synergy and legendary cost. Not looking at Cairne, this card is still strong because of tempo it creates. Its randomness does not consider rarity or class restrictions. This means you could get Pit Lord or Baron Rivendare as often as you get Defender of Argus, Dark Iron Dwarf or Chillwind Yeti, or any other particular 4 drop minion.